Break out your boots, stock up on tea and spruce up your home. As we head into Boulder’s coldest time of year, it’s time to embrace all things cozy. Unlike winterizing your garden or closet, winterizing your home doesn’t warrant a complete overhaul. This month: Our designers offer four simple and subtle ways to warm up the inside without touching the thermostat. We added a hide rug to warm up this dining room‘s wood floors. When prepping your home for winter months, seek out plush textures that beg to be touched: knotty knits, soft leather, fluffy sheepskin, luxurious velvet. The more your home feels like your favorite sweater, the more you will enjoy your winter environment. 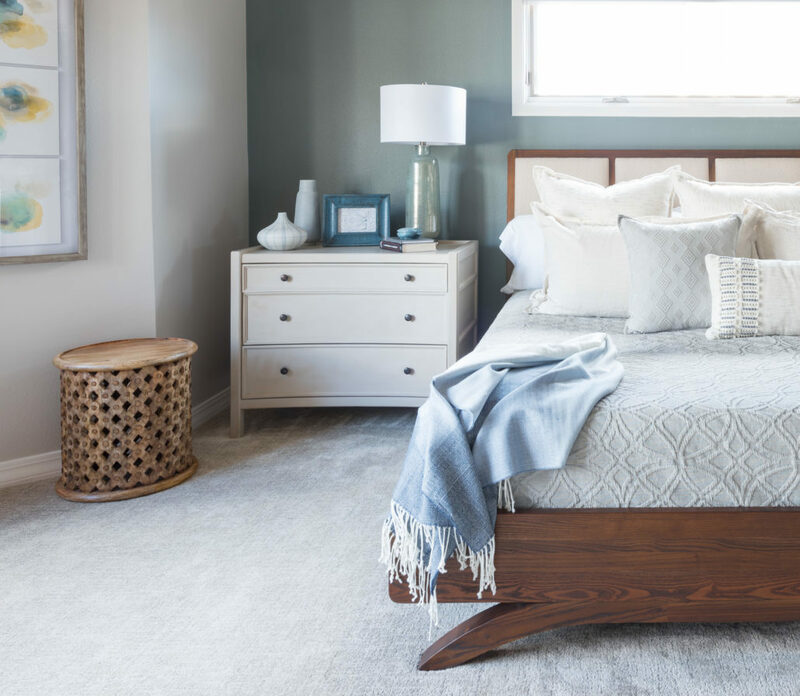 A wintry-blue throw blanket and a collection of cream pillows add extra comfort to this master bed. View our portfolio to see more of this design. The trick to crafting cozy environments is peppering them with cozy materials. It’s likely not practical to swap out your furniture each season, so consider draping blankets, scattering pillows and layering rugs. Even wicker can be easily warmed up with the right addition of texture. 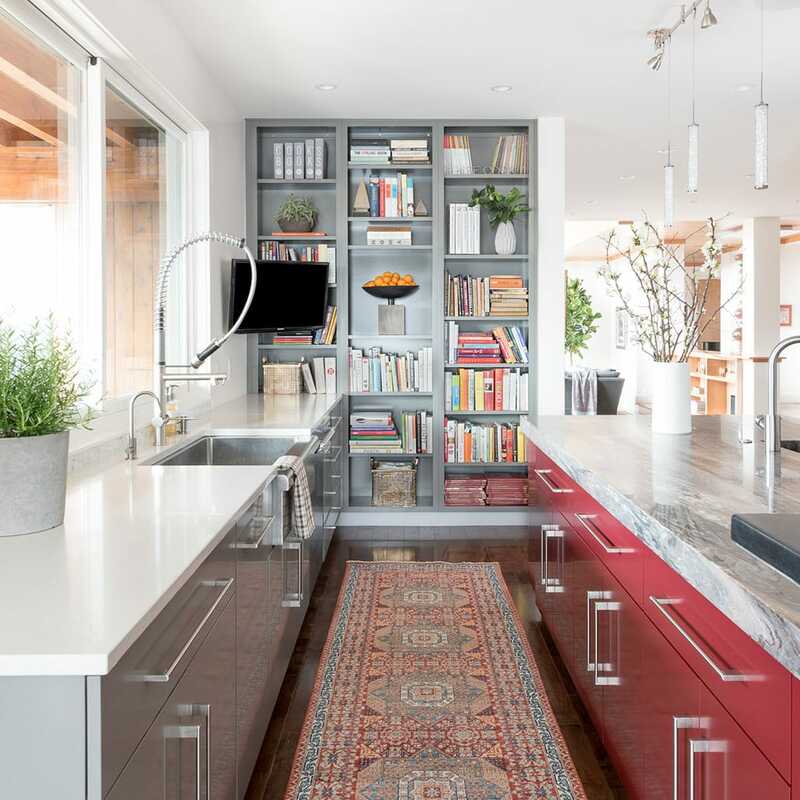 From the runner to the cabinets to the books on the shelf, we added splashes of deep red to this kitchen to add warmth throughout. The quickest way to cue winter home is to shift the color palette used inside. When thinking about the soft materials and tactile textures to be sprinkled throughout, choose colors that are similarly inviting. OR, go light. If your basic palette leans towards neutral, adding light grey, pastel pink, oatmeal or winter blue can create a fresh, airy quality. Durable Stout drapes look stylish and trap heat inside the home. Visit our showroom to browse more of their window coverings. Photo courtesy Stout. Windows not only provide a visual connection to cooler environments, but also (in many cases) invite cool air into your home. To warm up your view and boost efficiency, amplify your window treatments. Layer, layer, layer. 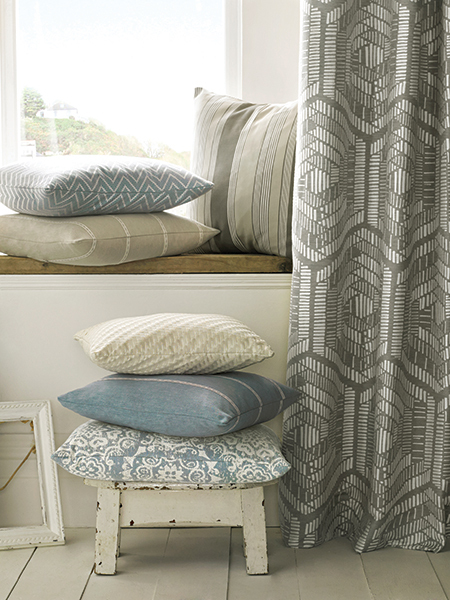 Winter is the perfect time to embrace dual curtain arrangements. Looking for more design ideas? Contact us.